First, I'd like to apologize about the slowdown of updates in the last week or so. Life's been kinda crazy. Not in a bad way, mind you. I'm looking for summer internships, and that precludes a bit of time and effort making phone calls, writing letters, doing research, etc. I was planning on talking a bit about the internship fair that occurred last week, but I'll hold off on that right now. Let me just say right now that I have an interview set up with one company, an application sent in and and a lot of talk with another company, and I'm on the lookout on a third (as well as a couple more). So, as you may remember me mention a few times before, I'm trying to lose some weight through a diet and exercise regimen. I thought I'd give you an update on it. Namely, I've currently passed the 200lb mark (going downwards). Which is pretty good, considering I started at 232. Now, last week I reached my halfway point toward my primary goal of 175 pounds. I decided to take a few pictures of myself to compare with some "Before" pictures like they have in all the commercials. It's pretty interesting. 1. Part of me wants to wait until I have reached my goal of 175lb to post the before-after comparison, as the change will be more dramatic. 2. The pictures are of me without a shirt, which - regardless of weight - may be an unpleasant experience for all involved. I dunno. If you really want to see pictures, let me know. Otherwise, I'll spare the Internet this time. Long story short, diet's going well. Remember to check out Elderly Apple! I know everyone's busy, but you can literally, literally see each day's idea (I don't specifically call them comics; there's no real punchline; they're just ideas) in 30 seconds or less. If you happen to have an additional 30 seconds, please leave a comment. Both on EA and TLD, comments are my lifeblood. As trite as it sounds, they give me the strength to keep going. More comments = more enthusiasm from me! Plus, it gives you an opportunity to say something witty. Remember, though, that Elderly Apple Andrew is different from regular Andrew. So don't expect a similar interaction. Finally, if you have 30 seconds more, please be sure to vote for the comic in the Top Webcomics Vote. The button's on the side of the site. The voting system's a little confusing at first, but spend a minute and you should figure it out. 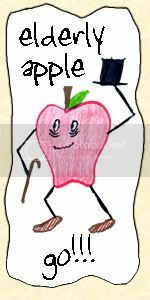 The more votes I get, the more notoriety Elderly Apple gets. Also, when you cast a vote, I will give you a random trivia fact that you (probably) didn't know before. This is updated every single day, so voting every day is the only way to know them all! Your knowledge is expanded, as is my user base. It's win-win! So, that's one-and-a-half minutes total. I understand if you feel that you don't have the time. But if you do, please check it out. It may seem simple, but it really is a strenuous mental exercise, and I want everyone to experience it. Wellp, nice to know you're busy. I guess I'll take the before and after pics, toss them in with your wedding picture =). I'll go to TEA and leave a comment, just for you.